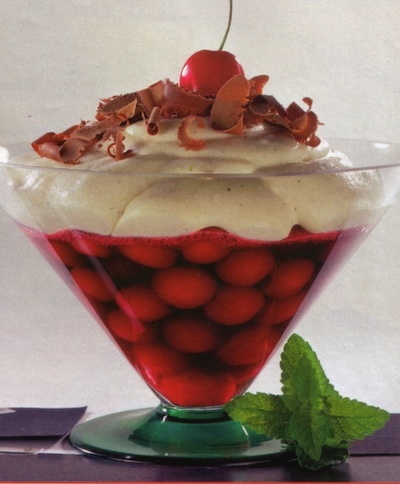 The Cherry Cream dessert is a delicious combination of sour cherries, heavy cream, and Kirsch Schnaps. In the South of Germany, especially in the Black Forest, you can get the best Kirsch Schnaps and sour cherries. These cherries can be found in many German baking recipes such as cakes and pastries. They are very juicy and therefor great for this dessert. Happy Cooking! 8 sheets red gelatin - if you cannot get them, use white gelatin and add some cherry or red grape juice to make it red. 1. Soak red gelatin for about 10 minutes; pit the fresh cherries and with the red wine and 2 tbsp sugar let them simmer for 3 minutes. Drain jar cherries and warm them with red wine, then take off the stove. 2. Press all water out of the gelatin; dissolve gelatin in the cherry compote and add the Kirsch Schnaps. Fill them into 6 decorative glasses and keep cool. 3. Soak the white gelatin. Slice vanilla bean and with the milk and remaining sugar bring it to a boil. Take out the bean, scrape out the vanilla pulp, and add it to the milk. 4. Beat egg yolks and whole egg until foamy; add it to the hot milk (but not boiling). While stirring bring it to a boil but take it off the stove right away; after 5 minutes dissolve the white gelatin in the milk. Keep it cool. 5. Beat the heavy cream until firm. The egg-milk cream will start to thicken, mix in carefully the firm heavy cream. Arrange the cream on top of the cherries, and sprinkle it with the grated chocolate and decorate with one whole cherry. Dr. Oetker has the best gelatin sheets here in the USA. Gelatin sheets are the purest form of neutral gelatin available with a strong set. Use to make molds, aspics, fondants icing, chaud/froid (jelled white sauce to glaze hams, turkeys, etc.) and desserts. Perfect to top and seal homemade pâtés. Simply soak the sheets in cold water for one minute, squeeze, then add to boiling water or any other liquids. Cool and let set. When set, gelatin can stand at room temperature for several hours without weeping. Great for a buffet setting.